Robert Lewandowski chalked up more records in Bayern Munich's 6-0 win over Hamburg on Matchday 26, scoring his 100th Bundesliga goal for the Bavarians and becoming their all-time leading foreign goalscorer in all competitions. After eclipsing Giovane Elber's record of goals in Bundesliga games back in January, Lewandowski overtook the Brazilian's haul in all competitions for the Bavarians with his goals against HSV. The 29-year-old moved onto 140 goals in his 182nd game for Bayern to set the new record before adding goal number 141 just a matter of minutes later, scoring two goals in a Bundesliga game for the fifth time this season. Lewandowski then completed his first hat-trick in the Bundesliga this term, and first since Bayern's 6-0 win against Augsburg last April, with a goal which took him to the next milestone in his glittering Bundesliga career: a century of goals for Bayern. Earlier this season Lewandowski overtook Claudio Pizarro's haul of 87 Bundesliga goals for Bayern, although the Peruvian remains the league's all-time leading foreign goalscorer with 192. Lewandowski is currently on 174 overall, having also scored 74 times for Borussia Dortmund. Twice the top-flight's leading scorer, the Bayern striker became the first foreign-born player to reach 30 goals for a season in 2015/16, repeating the feat last season. Meanwhile, his Europe-best 16 2018 FIFA World Cup qualifying goals for Poland showed he can produce on both the domestic and international stage. 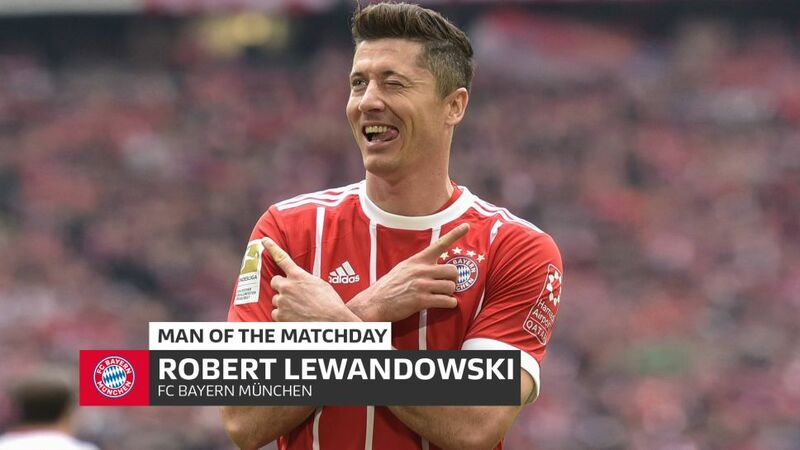 Having already broken into the top ten of goalscorers in the Bundesliga, it stands to reason that Lewandowski is regarded by bundesliga.com as one of the best three Bundesliga goalscorers of all time.